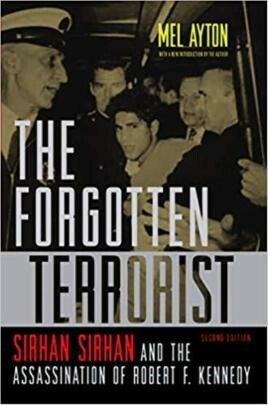 In The Forgotten Terrorist Mel Ayton profiles Sirhan Sirhan and presents a wealth of evidence about his fanatical Palestinian nationalism and hatred for Robert F. Kennedy, which motivated him to assassinate RFK in 1968. Now with a new introduction containing interviews and new evidence. • Fiftieth anniversary of the shooting has renewed interest. Robert F. Kennedy's assassination in 1968 seems like it should be an open-and-shut case. Many people crowded in the small room at Los Angeles's famed Ambassador Hotel that fateful night saw Sirhan Sirhan pull the trigger. Sirhan was also convicted of the crime and still languishes in jail with a life sentence. However, conspiracy theorists have jumped on inconsistencies in the eyewitness testimony and alleged anomalies in the forensic evidence to suggest that Sirhan was only one shooter in a larger conspiracy, a patsy for the real killers, or even a hypnotized assassin who did not know what he was doing (a popular plot in Cold War-era fiction, such as The Manchurian Candidate). Mel Ayton profiles Sirhan and presents a wealth of evidence about his fanatical Palestinian nationalism and his hatred for RFK that motivated the killing. Ayton unearths neglected eyewitness accounts and overlooked forensic evidence and examines Sirhan's extensive personal notebooks. He revisits the trial proceedings and convincingly shows Sirhan was in fact the lone assassin whose politically motivated act was a forerunner of present-day terrorism. The Forgotten Terrorist is the definitive book on the assassination that rocked the nation during the turbulent summer of 1968. This second edition features a new afterword containing interviews and new evidence, as well as a new examination of the RFK assassination acoustics evidence by technical analyst Michael O'Dell.